If you’ve been working digitally for any amount of time, you know the importance of going to press with images that are the best quality, with the highest resolution and crispness you can achieve. It only stands to reason that the better the art is when it gets ripped for press, the better your end result will be. Lately, I’ve seen images come across my desk that appear to have been altered from what can only be described as postage stamp-sized images. This is typically because the image was originally created for use on a website (which typically requires smaller images for faster web page loading). I know many tips and tricks in Photoshop that can help get more than would be normally allowed from any particular image, but even the best Photoshop magicians can’t make a postage stamp sized image look good on a 20′ x 40′ backdrop. If you’re having trouble estimating if your image is big enough or has enough data, here’s what the numbers mean when you’re looking at the file size info. The rule of thumb on the internet and out of a digital camera is 72ppi. This said, if you’re looking at the data size of your image and it says , for instance, that the image is 7200x 3600, it’s letting you know that your image is 10″ wide and 5″ tall. This image would be a bit small to go to press at 20′ x 40′. The best advice I can give you is to either use a professional designer who deals in large format on a regular basis, or give us a call at the start of the project and we’ll go over the required specs so that you’re empowered when you start the design process with your favorite designer. Of course, if you don’t have a favorite designer, we are always available to manage the project from start to finish, including creating a custom artwork file, printing it, and sewing the finished digital backdrop. Patriarc is an all-purpose heavy duty stage curtain track especially designed for large and reverse curved stages, such as in very large venues such as opera houses which need to accommodate an arced stage curtain or large cyclorama. With 7 gauge extruded aluminum I-beam construction, Patriarc is available in the standard aluminum finish or in a black finish. Used extensively for curved operations, Patriarc is custom curved at the factory, and therefore, if a curved track is required, a scaled drawing of the desired track configuration is requested at the time of quoting / ordering. 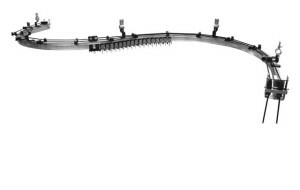 While curved Patriarc curtain track is available in a manually-operated cord-drawn operation, we recommend selection of a motorized operation for curved configurations. Walk-along, cord-drawn, or motorized are all appropriate for straight track configurations. Cord-drawn and motorized operations may be configured to a variety of lengths, dependent on the specific layout desired, with no maximum track length specified. Patriarc will accommodate a maximum curtain of up to 30 pounds per foot of track. As Partriarc can accommodate the added weight, it is the perfect choice to carry Grand Drapes constructed with 100% fullness from a heavy weight theatrical velour such as 25oz Memorable Velour or 32oz Magic Velour. We are thrilled that our very own President and Co-Owner of Rent What? Inc., Megan Duckett, will be speaking at this year’s Spark and Hustle Tour. Her topic will be Sales and Scale from 1:30pm to 2:10pm on May 31st at the Four Points Sheraton at LAX, in the California Ballroom. This is very exciting for us especially, because Spark and Hustle is one of the most renowned conferences focusing on helping small business owners (women especially) build the successful company that they always dreamed of. This current leg of the tour is just one part of a 20-city series of day-long conferences for current and aspiring small business owners to learn fresh ways to build their business and boost their bottom line, while also collaborating with others in similar situations. The events are led by Tory Johnson, weekly contributor on Good Morning America, contributing editor to SUCCESS magazine and a New York Times bestselling author. To learn more about the events—and of course to join Megan while she shares her expertise on her own company’s continued rising success in hard economic times—please visit their website at www.sparkandhustle.com. We are proud of Megan for being part of something so impressive, and for sharing her hard-earned wisdom and knowledge on this extremely important topic. Break a leg, Megan! The premier heavy duty curtain track choice for larger traditional theatres, performing arts centers, civic auditoriums, and larger universities and high schools, Silent Steel is a box-shaped track constructed of 14 gauge galvanized steel and is available in the standard steel finish as well as in a black finish. Silent Steel is considered the larger version of Besteel, allowing for a longer maximum length and heavier curtain weight. As Silent Steel track channel is box-shaped, it cannot be curved, either onsite or at the factory, and therefore cord-drawn and motorized models are available for a straight track configuration only. However, if a walk-along model is selected, prefabricated curved sections ranging from 45 degrees to 90 degrees are available and can be attached to a straight section of track to create a simple curve shape (such as a wide “U”). Walk-along, cord-drawn and motorized are all available options with Silent Steel. Cord-drawn and motorized operations may be configured for a maximum length of 60 feet or 80 feet, depending on the model selected. Walk-along models may be configured at any length. Maximum curtain weight for Silent Steel curtain track ranges from 20 pounds to 50 pounds per foot of track, depending on the specific model chosen. As Silent Steel can accommodate the added weight, it is the perfect choice to carry Grand Drapes constructed with 100% fullness from a heavy weight theatrical velour such as 25oz Memorable Velour or 32oz Magic Velour. Every artist wants to give their fans a night to remember when they come out to see their show. Visual impact and the element of surprise are two key aspects in the recipe for a concert that will be a night to remember. Something that we can do that many people don’t think about is add UV graphics or text to your backdrop. As you may know, UV is only visible when the graphics are hit with a special UV light. One of the most elaborate uses of this technology is the recent backdrop we did for country singer Eric Church. After digitally illustrating a forty foot concrete wall and adding a distressed version of his logo to the graphic, we created a second set of graphics in a graffiti-inspired, “tagged” theme that appeared across the entire surface as if the concrete wall had been spray painted. The result was jaw dropping as the graffiti seemed to magically appear across the backdrop when hit with the UV light.